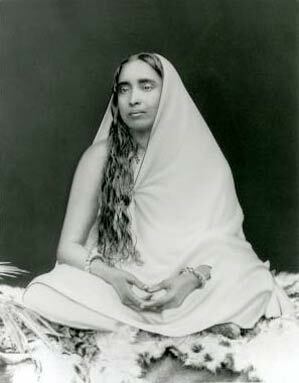 Shrine pose photograph of Holy Mother, Sri Sarada Devi. In November 1898 Mrs. Ole Bull, an American devotee of Swami Vivekananda, persuaded Holy Mother to have her photograph taken. On this occasion three pictures were taken, and the second is the one most often worshipped by her devotees. Holy Mother said of it: “Yes this is a good picture. But before it was taken I was a little stouter. Then Yogen [Swami Yogananda] fell ill. Worrying about him day and night, I lost some weight. I was happy when he felt better, but very unhappy when he was worse. Often I wept for him. At first I refused to be photographed. But Sara [referring to Mrs. Ole Bull] pressed me and said, ‘I shall take the picture to America and worship it.’ In the end I had to agree.” (Holy Mother by Swami Nikhilananda, p. 114). This picture of Holy Mother when she was forty-five was taken at 10/2 Bosepara Lane, Baghbazar, Calcutta, by Mr. Harrington, an English photographer. On March 9, 1899, Sister Nivedita wrote to Mrs. Eric Hammond: “You know that photograph meant the first time she [Holy Mother] had ever looked straight at a grownup man outside her own family, or been seen by one. Yet what self-consciousness was there? Not a grain! 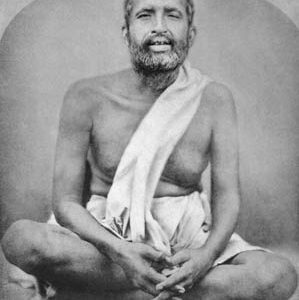 Neither Swami [Vivekananda] nor Sri Ramakrishna himself ever saw her unveiled – after her marriage, that is, when she was a little girl of five!” (Letters of Sister Nivedita, Vol. 1, p. 76). 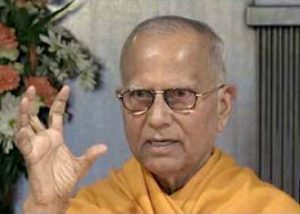 In 1970, when Swami Chetanananda was at Advaita Ashrama in Calcutta, Swami Ishanananda (a disciple of Holy Mother and an attendant of hers for eleven years) stayed there for some days. 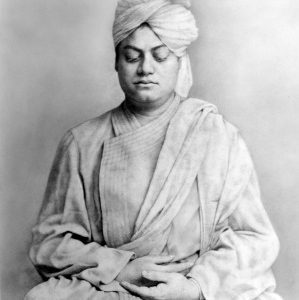 One day he showed Swami Chetanananda an original print of Holy Mother’s shrine pose (the second photo) which had belonged to Sister Nivedita. Swami Chetanananda asked the swami to let him have the photo for the archives of Advaita Ashrama, and the swami gave it to him. It is still there. During Swami Chetanananda’s trip to India in 1982, he made several negatives from that beautiful, original print and brought them to America so that the Western devotees could have a clear (second generation) photo of Holy Mother.